I have mentioned before my love for The Sea Captain’s Wife, here and, now, here. When I heard that Beth Powning had a new book coming out, I couldn’t wait to read it. From the pages of early American history, a novel about an indomitable woman who defies prejudice, the conventions of marriage and the threat of the gallows to oppose a cruel regime’s murderous persecution of the first American Quakers. This book includes two subjects that I am always interested in learning more about; emigration to North America, and different religious groups. I have enjoyed reading about the Quakers in other books I’ve read, including The Last Runaway, The Purchase, and All True Not A Lie In It, and have loved their association with the Abolitionist Movement. But, I was never quite clear on the origins of the Quakers. A Measure of Light has changed that for me. Through Mary Dyer, we learn about the origins of the Quakers in America, their beliefs, the reasons they felt strongly about separating from other settlements, as well as about the unsettlement in Europe around the time of King Charles I and Oliver Cromwell. The story begins in England as Mary Dyer and her husband William decide to go to America to get away from the unrest in London. But, in Boston, they don’t find things to be much better. When Mary gives birth to a baby with severe birth defects, her midwife, Anne Hutchinson, tries to keep it quiet, but word gets out, and Mary becomes known as the ‘mother of a monster’. Mary wonders if she is being punished by God, or if God is trying to tell her something. In the strict Puritan community, anything that happens is a message from God, and severe punishments are handed out regularly. Mary becomes depressed. William goes in search of a new place to settle where they will be left alone by the Puritan regime. They eventually settle in Newport, and go on to have more children and a thriving farm. But, Mary cannot bring herself out of her depression and feels little attachment to her life. She goes back to England to see her Aunt one last time, and falls in with the Quakers while she is there. This prolongs her visit to England, but also brings her some comfort, as she starts to see a new purpose in life. She comes back to New England with a renewed sense of hope and purpose, but remains somewhat disconnected from her family. Instead, she focuses on her new group of Friends, riding into Boston to help protest the Puritan regime. I’m not sure how I felt about Mary Dyer. Before she became depressed she was easy to like; full of life and hope for the future. But, despite feeling sympathy for her, it was hard not to also feel saddened and frustrated when she spent all those potentially wonderful years with her young family feeling detached from them. I felt sorry for her family, particularly her husband who didn’t know what to do to help her, but never stopped loving her. Whether you find Mary likeable or distant, strong or weak, brave or foolish, you will most certainly find her life interesting, especially for a woman living in the early 1600s. She was well educated for her time, and held strong opinions. She felt the frustration of being a woman in a time when women’s thoughts and opinions did not matter. She felt herself to be poised between two places of equal, but different, terrors. Here, in England, persecution. There, in New England – wolves, forests, fierce winters. In such a place, a person’s smallest act would be laid bare to God – and thus, she thought, one’s existence could become a matter of terror. Or ecstasy. Misbehavior of one can bring wrath down upon all. She no longer prayed nor asked for forgiveness. God’s silence was absolute and the light of the world was not hers, neither beauty, nor joy, nor peace… She had become a vessel for bearing children, never knowing when God might see fit to send another monster or call home the tiny creatures. There were no words for the emptiness where love should be but was not. Back, she went, walking the roadway the Lord had set her upon. She saw how it led, step by step, to this place. While reading A Measure of Light, I was caught up in Mary’s life and the events surrounding it. Not because this is a fast-paced novel – it’s not, but because Beth Powning puts so much care and detail into her research and writing. History oozes from the pages. At the end of the book, Powning lets us know what is fact and what is fiction – something I greatly appreciated. The book is full of the people who actually lived in these places at these times, some more notable than others, including; King Charles I, Oilver Cromwell, William and Mary Dyer, George Fox, Rev. John Cotton, John Winthrop, Anne Hutchinson, and Alice Tilley. Beth Powning is the author of several other books, including The Sea Captain’s Wife, Home, The Hatbox Letters, Edge Seasons, and Shadow Child. Beth Powning is, herself, a New-England born Quaker who now makes her home in New Brunswick, Canada. *Thanks to the publisher for sending me a copy of this book. All the quotes used in this review are from an uncorrected proof. Anything that oozes history must be good! I went home to check and I DO have a copy of this. So many signs telling me to actually read it! If you like history, women in history, history of religious groups, history of North America, or all of the above, then you should like this book! I really like the sound of this. Sometimes I like a good historical novel with an interesting setting. This one is just jam-packed with history, but in a way that doesn’t feel like it is. And, I loved that, at the end, she explains what is fact and what is not. I think you would like it! Excellent review! I’ve never heard of this writer. She is a wonderful writer, and I can now confidently recommend two of her books – this one and The Sea Captain’s Wife. Thanks for commenting! I have The Sea Captain’s Wife on order and this one sounds good, too. No worries! I totally understand that different people like different books. I have a friend who occasionally sends me scathing messages when she doesn’t like what I recommend, and it always surprises me. It’s like she thinks I tried to trick her into reading something she would hate. Don’t quite know what to make of it. I loved Beth Powning’s other books and I’m looking forward to reading this one. Thanks very much for this post — I’m now even more keen to get my hands on a copy. It’s always nice to ‘meet’ another fan of Beth Powning. And, now that I have visited your blog, another fan of all Canadian Literature and fellow Nova Scotian. I hope you like the book as much as I did. Thanks for visiting! I bought The Sea Captain’s Wife because of that stunning cover (and well the story looks great too)! 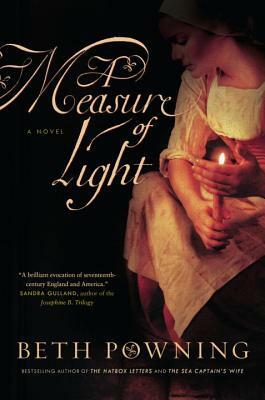 Then I saw that “A Measure of Light” was coming – got a copy from Random House Canada, and like you found this to be a fascinating read! Mary is frustrating isn’t she? You can be in awe of her for her steadfast beliefs, but frustrated at her for just leaving her family behind so easily and willingly accepting death. Great read though! I agree. Sometimes it was hard to like her, but I often was in awe of her and all that she did so long ago. It was a good thing she had such a great live-in nannie/servant, and a good husband to cover for her whenever she was gone or just vacant. The history of it, though, was so impressive. I learned or was reminded about so many historical figures that I have come across before or not at all. She made all the bits and pieces come together for me. I hope you enjoy The Sea Captain’s Wife just as much!